BlueStorm Unified NAS consolidates NAS and IP-based iSCSI SAN in one box. Unified storage can help consolidate your IT infrastructure and reduce hardware expenses. You don’t need multiple file servers for SMB, NFS, AFP, FTP, and WebDAV. BlueStorm unified NAS supports all these protocols in one box including iSCSI. BlueStorm unified NAS will be your common storage pool that is accessible at either file or block level over existing IP networks. It’s the most cost-effective and efficient storage solution. BlueStorm unified NAS Rx401R has also equipped with redundant power supply modules to increase its availability along with all high end Unified NAS . It’s rare to see such combination in 1U form factor. BlueStorm unified NAS adopts ZFS file system, which is a transactional, copy-on-write, crash-free file system with 128-bit huge addressing space. ZFS can detect silent data corruption and has self-healing capability and guarantees end-to-end data integrity. There are abundant RAID levels* to choose from to meet application requirements such as redundancy and performance. *Rx401R only supports RAID 0, 1, 5, 10. Q-turbo offload engine includes both SOE (Samba Offload Engine) and ZVIOS (ZFS Volume IO Scheduler) modules, two innovated in-house IO acceleration technologies from our ODM. SOE can greatly improves SMB (Small Message Block) protocol performance. ZVIOS can accelerate block IO such as iSCSI protocol performance. BlueStorm unified NAS supports using high performance SSD drives as fast storage tiering. SSD caching* can greatly improve random IO performance. You can combine SSD drives and SATA drives as a hybrid storage pool and have a net performance result of a pure SAS storage pool. *Rx401R does not support SSD caching function. All BlueStorm unified NAS product lines can leverage the strengths of SSD drives to become a so-called Hybrid Storage. With SSD caching function, SSD drives act as a fast tier between traditional hard drives and memory to speed up random IO performance. 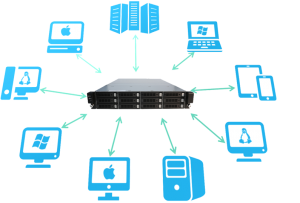 Thin provisioning allows just-in-time capacity and allocates storage space that does not exist. You can delay the hard drive purchase until it is absolutely necessary. Inline, block-based deduplication helps you remove data redundancy at block level. It’s a must-have feature for file backup, data archive, VDI and mail databese applications. It’s very easy to use and can be switched on/off at any time without impacting data access. It’s a practical function only found in enterprise storage. File-level snapshot helps IT administrator to retrieve a file as easy as browsing through a directory when things like virus attack and accidental deletion or modification happens. You can rollback the snapshot to a certain point in time in the past or clone the snapshot to become an independent folder. BlueStorm unified NAS supports snapshot for block-level storage such as LUN. Using copy-on-write technology, differential data are recorded between two given points in time. You can rollback the snapshot to a certain point in time in the past or clone the snapshot to become an independent LUN. BlueStorm unified NAS supports both Rsync and block-level snapshot-based replication function. Both of them are asynchronous. Remote replication task can be created for folders and LUNs. Only differential data at block level will be replicated to achieve maximum efficiency. Replication function is provided by storage array. No host server resources are involved and host servers can remain focusing on mission-critical applications. When disaster strikes at site A, you can quickly switch to storage array at site B to make sure business continuity and data security. No hassle for cables and no reduction in thermal efficiency. Neat and cable-less backplane design gives BlueStorm unified NAS LX the lower latency and the best heat dissipation capability. And it is super easy for hardware maintenance. With versatile host interfaces (10GbE iSCSI, 16Gb Fibre Channel) to choose from, U300 is the genuine multi-protocol unified network attached storage. Both iSCSI and Fibre Channel are supported at the same time in one enclosure. RX2404R can easily fit into enterprise IT environment and consolidate your file servers and storage area network (SAN) applications.